Janet Reid, Literary Agent: Blog hiatus Day Fourteen! This is Charlotte. She was living in a cage at Westside German Shepherd Rescue in Los Angeles, and was one of the dogs I met when I was a volunteer dog walker. I brought her home as a foster, and became a foster failure within 12 hours. She’s lived with us six years now, and we think she is ten or eleven. She had little interest in my WIP, because it is set in France, not Germany. 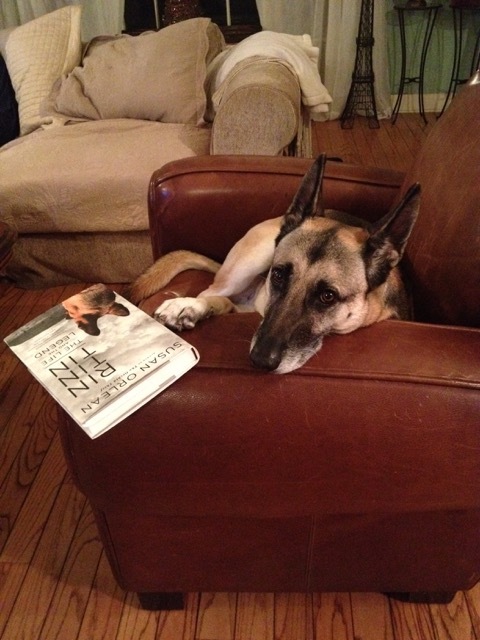 After reading this book and finding out Rin Tin Tin was French, she’s expressed a little more interest. She’s got fans all over town, because she has that je ne sais quoi quality. Ooo! There is a Day 14 post after all. When no post showed up this morning I thought Henry was being given an extra day because he's a little slow-moving, but no, he finished after all. Now Charlotte has time to show off a bit. Another pet to love, another dog rescued. How kind you all are. What a well-read girl! I am a fellow foster failure (love that term, lol). Those eyes would sure be hard to resist. I no longer do wildlife caring (you guys have a different term for it which has escaped me at the moment), or fostering or anything like that because I am an "animal in my home" failure. I can't even go to the pound with a friend because I can't help myself. I can see why Charlotte stole your heart. She's lovely...and well read! A winning combination for sure. You look comfy. Enjoy your day. I would definitely be a foster failure. Gage the Wonder Dog was supposed to be a dog I kept overnight. He's been here five years now. What a beauty Charlotte is. Good job Charlotte's angel. German Shepherds were the dogs of my childhood. The way they could look into your eyes taught me a lot about the world. The strength of conviction in their eyes is awesome. I can see a lot of it, still, in Charlotte's eyes. I know I would fail fostering her too.